Anniversary • Lincoln's famous address discussed in video conference. Al Hartmann | The Salt Lake Tribune Fifty high school students from the Salt Lake City School District recite the Gettysburg Address while watching The National Park Service's Dedication Day Ceremony at the SoldierÌs Cemetery in Gettysburg, Pa. The event was streamed live at GettyReady.org and select schools around the country took part in a video link where students asked questions of national park historians. Al Hartmann | The Salt Lake Tribune Anthony Flamini, a junior at East High School, asks a question on the live video link at GettyReady.org to a national park historian. Fifty high school students from the Salt Lake City School District gathered at the Eccles Broadcast Center at the University of Utah for the National Park Service's Dedication Day Ceremony at the Soldier's Cemetery in Gettysburg, Pa. Al Hartmann | The Salt Lake Tribune Fifty high school students from the Salt Lake City School District recite the Gettysburg Address while watching The National Park Service's Dedication Day Ceremony at the Soldier's Cemetery in Gettysburg, Pa. The event was streamed live at GettyReady.org and select schools around the country took part in a video link where students asked questions of national park historians. Al Hartmann | The Salt Lake Tribune Cameron Jones of East High School asks a question on the live video link at GettyReady.org to a national park historian. Fifty high school students from the Salt Lake City School District gathered at the Eccles Broadcast Center at the University of Utah for the National Park Service's Dedication Day Ceremony at the Soldier's Cemetery in Gettysburg, Pa. Al Hartmann | The Salt Lake Tribune Fifty high school students from the Salt Lake City School District recite the Gettysburg Address while watching The National Park Service's Dedication Day Ceremony at the Soldier's Cemetery in Gettysburg, Pa. The event was streamed live at GettyReady.org and select schools around the country took part in a video link where students asked questions of national park historians. Al Hartmann | The Salt Lake Tribune Fifty high school students from the Salt Lake City School District pledge allegiance while watching The National Park Service's Dedication Day Ceremony at the Soldierís Cemetery in Gettysburg, Pa. The event was streamed live at GettyReady.org and select schools around the country took part in a video link where students asked questions of national park historians. 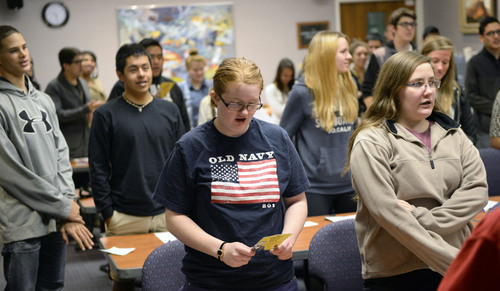 Unlike Cornell High School students near Pittsburgh, who have been on field trips to the Gettysburg battlefield, East High School students in Salt Lake City are far removed. That might explain the somewhat blunt question that student Cameron Jones asked of a Gettysburg National Military Park ranger Tuesday during a video conference featuring students in Pennsylvania, New Jersey and Utah. The conference followed a nearly two-hour ceremony commemorating the 150th anniversary of President Abraham Lincoln&apos;s Gettysburg Address at the Pennsylvania battlefield cemetery. 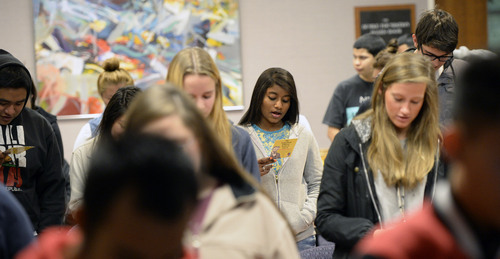 The ceremony was broadcast over the Utah Education Network, at gettyready.org and for 30 East High students in a conference room at the University of Utah&apos;s Eccles Broadcast Center. "If Utah wasn&apos;t even a state back when the Civil War was going on, why is it important for us to study the Civil War?" Jones asked. Caitlin Kostic, who works as a seasonal ranger at the park, told Jones that understanding the fight between the states is fundamental to understanding Utah&apos;s foundations. "We&apos;re all connected," she said. "Each state is connected, (They&apos;re) not separate entities with no relationship to each other." But Kostic was unable to answer Jones&apos; second question: "Do their chickens have large talons?"  a question intended, perhaps, to add levity to the video conference. "I don&apos;t understand that question," Kostic said. East High&apos;s Anthony Flamini asked her one she could answer: "Why do Americans still remember Lincoln&apos;s words even when they took place 150 years ago?" Lincoln&apos;s address was vague, she said, and that makes it transcendent. "He never once says &apos;Union.&apos; He never once says &apos;Confederate.&apos;"
"He doesn&apos;t limit himself verbally to a time period," Kostic said. "That&apos;s why there&apos;s meaning for future generations." 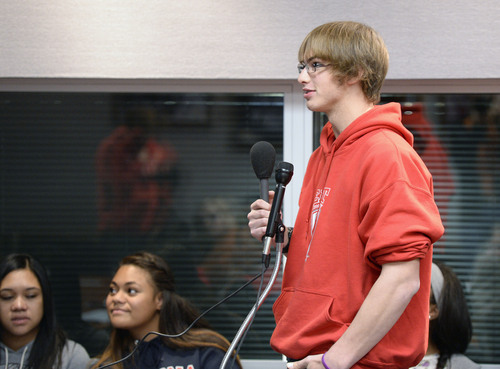 Other East High students, from U.S. government classes, asked about the five slightly varying versions of the Gettysburg Address, and which line of the address is Kostic&apos;s favorite. One East High student asked to hear the favorite lines of the students at Passaic High School in New Jersey and at Cornell in Pennsylvania. Those in New Jersey liked Lincoln&apos;s phrase about not being able to dedicate or consecrate the fields where men died in battle and the beginning, "Four score and seven years ago…"
Students in Pennsylvania liked that Lincoln honored men who sacrificed their lives. Monique Gonzales, 16, a junior at East, said after the video conference that while she liked learning about Lincoln&apos;s message, she especially liked "meeting" students from other states. "I liked communicating with other schools," she said. Students throughout Utah have been memorizing the Gettysburg Address, and some, such as Forbes Elementary in American Fork, and Judge Memorial Catholic High School in Salt Lake City, have taken part in documentarian Ken Burns&apos; Gettysburg project. Dozens of classes and many families throughout Utah are making a project of the Gettysburg Address this fall. Read our earlier story here.